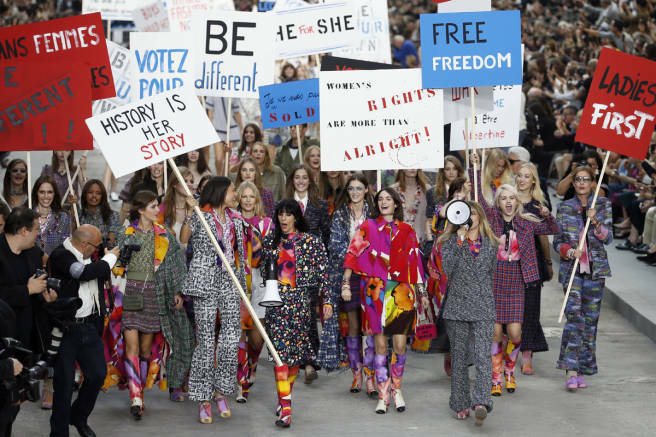 Lagerfeld’s Boulevard Chanel, an ironic staging of protest sign politics (using haute couture, supermodels, and the traditional Parisian boulevard protest as props), draws attention to the troubled relationship of feminist discourse to wealth and the beauty industry. The only things missing from this political mise-en-scène are Sartre and de Beauvoir. Friends‘ Beckettian repartee approximated the abyss of existential nothingness more successfully than Seinfeld. Although she was less literary than her predecessor Dorothy Parker, Ms Rivers was the gold standard for snark in our era. 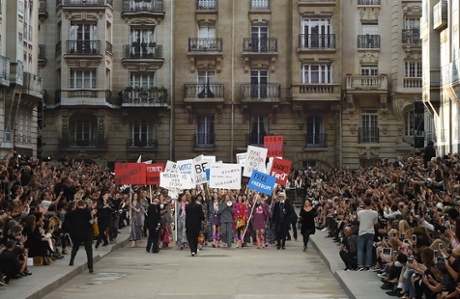 Lagerfeld’s haute chav collection is unfortunate. Homo sapiens are the ISIS of the animal kingdom.